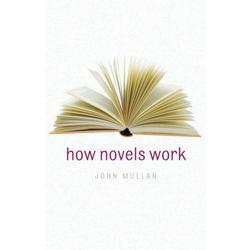 I’ve now finished John Mullan’s book How Novels Work, and I enjoyed it, with only a few reservations. The book is a survey of the various technical aspects of fiction-writing; it has chapters on “Beginning,” “Narrating,” “People,” “Voices,” “Genre,” and so on, and each chapter is broken down into smaller sections on, for example, the various types of point of view, different character types, or various literary techniques such as the use of epigrams and novels-within-novels. The book is a thorough and systematic introduction to the basics. As someone who has studied literature for many years and taught it for quite a few as well, there wasn’t much that was new to me here, although some of the vocabulary I’m not sure I could have defined (I can never remember words like “prolepsis” and “ekphrasis”) and I had to look up the term “roman-fleuve” (which, oddly, Mullan doesn’t define). But I think anyone who wants to know more about how novels work will enjoy this book and learn a lot from it, and for me, much of the pleasure of reading the book came from the way Mullan deploys his examples. Mullan’s procedure in each chapter is to take one or two contemporary novels and analyze their use of the relevant formal element. In fact, the book came out of a series of Guardian articles meant to explore contemporary novels that might be popular with book groups. Mullan doesn’t draw solely on contemporary fiction, however; what I like about the book is the way he makes connections between contemporary novels and older fiction, particularly from the 18C, showing how recent writers are part of a tradition. For example, in a section on “Addressing the Reader,” Mullan moves from Henry Fielding’s novel Tom Jones to Martin Amis’s Money, showing how each novelist tries to establish a certain kind of relationship with the reader by addressing him or her directly. He talks about the rather strange continuing reliance on letters as a plot device in fiction, a reliance that made perfect sense in Jane Austen’s day, but not as much in ours. It’s easy to think that writers are working in entirely new ways these days, and Mullan reminds us of the continuity of forms and techniques. I did get a little tired of seeing the same books appear again and again as I worked my way through the book. Mullan has his favorite writers (Ruth Rendell, Michael Cunningham, Mark Haddon and others) who make multiple appearances in different chapters, and while I can see how finding new examples might have been difficult (particularly since Mullan had that material from the Guardian articles already ready to go), the book does get a tad repetitious in places. This problem may stem from the book’s source in those Guardian articles; the articles were organized around particular novels that Mullan used to elucidate a number of different literary techniques, so in the migration to a book organized by technique, the insights about particular novels necessarily got spread around into different chapters. Still, I liked this book more than Francine Prose’s Reading like a Writer (which I posted on here and here). The books both attempt to dissect fiction into its parts in order to help readers understand it better, although Prose’s book is more focused on helping people who want to write, while Mullan’s is aimed more toward an interested, general reader. Both books are most interesting in the way they use examples and both books offer a useful overview of the basics. But Prose’s advice-giving tone bothered me at times — she’s clearly trying to get you to read in a particular way — while Mullan’s mode of analysis rather than didacticism suits me better. Given my last two posts, you can see how obsessed I am with what makes a novel a novel. It’s part of the reason I love studying the 18C, as it gives you a chance to see how it all began (unless, that is, you think the novel actually began much earlier!). This sounds like a great book (not least since it mentions Ruth Rendell’s work). You always read such interesting nonfiction, and I think I am going to have to see if my library has it–especially if it is aimed towards the general reader. I wouldn’t mind reading the Prose book, too, as I always think it wouldn’t hurt to improve my writing (but I tend to be very lazy about it!). When do you think the novel began, Dorothy? Very interesting review, Dorothy! I would get fed up with the same examples being used over again – there’s no excuse given the amount of great fiction out there. I often pick up this kind of book and then hesitate as I’m afraid it would frustrate me. I find I have my own set of beliefs about what fiction is and how it works and then get stubborn about them! This book sounds interesting. I like books like this, but like Verbivore, I wonder if I would like it? Also like her, I guess there is only one way to find out! When I think of the history of the novel, I think of Cervantes. Damn good story. This is a book I enjoy dipping into, but I have found it very useful to give to friends who don’t have a ‘literary’ background and want to know more about the way in which the novel works. And, for them, the fact that he doesn’t use too many books as examples is useful because they can more easily pick up what he’s talking about without having to do too much reading. Danielle — oh, good question! I think it all depends on how you define the novel. I’d say I think prose fiction becomes more clearly novelistic in the late 17c and early 18c. How is that for not answering your question? 🙂 Definitely Mullen and Prose are good for general readers and I’d recommend them. Litlove — I suspect you’d be able to write an excellent how fiction works book yourself! Verbivore — you might enjoy the book, but I doubt it would have much to teach you about technique — the posts you’ve written on it are much more detailed and advanced than anything in Mullen’s book. He really is writing for beginners. But the book still has its pleasures. Stefanie — it might be a good book to test out … if you don’t like it, it could get a little long. Tom — yes, indeed! You can’t tell the story of the novel with a little Cervantes, at least. Ann — you’re right that if you wanted to read along with him, you certainly could. He’s writing largely for book groups, after all, people who might really be reading along with him. Yeah, it would make a great read for those without much background. Intriguing. One facet of my being desires to read this. Another side is afraid that I am already too analytical and this knowledge would eliminate any remaining capacity to just enjoy a book.